Audi steering and suspension systems are engineered to exacting specifications. Combined, they enhance the comfort of your ride while providing you with crisp, responsive handling. These two systems are directly related to each other, which is why they are often referred to together. Audi has been at the forefront of improvements in steering and suspension systems. Increased strength and durability of components, and advances in tire design and construction have made major contributions to ride comfort and to a more gratifying and safe driving experience. The standard mechanical steering system is a connection from the steering wheel to the front wheels. All steering systems have pivot points. The pivots are ball and socket joints that wear out over time and eventually require replacement. Bring your Audi to German Car Depot for all of your Audi steering-suspension needs. Loose steering parts will make your car difficult to handle and will cause your front tires to wear out prematurely. That's why it is so important to have your Audi's steering and suspension components serviced at the first sign of trouble. Make sure all your steering components are functioning properly and supported in the proper position to keep the left and right side wheels working together. Suspension is the term given to the system of shock absorbers and linkages that connect a car to its wheels. The suspension system has two basic functions: 1) to keep your car's wheels firmly contacted with the road providing traction and 2) to provide a comfortable ride experience for the car's occupants, isolating them from bumps, vibrations and road noise. Bring your car to German Car Depot for all of your Audi suspension needs. The tuning of modern suspension systems is often finding the right compromise between solid traction and ride comfort, Under normal conditions, the springs support the body of the car evenly by compressing and rebounding with every up-and-down movement. GCD's BOSCH certified technicians will minimize the undesirable effects due to bouncing and swaying. Our expert technicians will examine all aspects of your car's suspension and if needed repair or replace any worn out parts such as struts, shock absorbers etc. 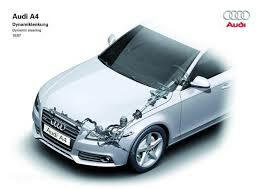 Well maintained suspension and steering systems are vital to your Audi's driving characteristics. They affect not only the comfort of your ride but also your vehicle's stability, braking behavior and its overall safety. Each vehicle has a unique set of characteristics with specific shock and suspension requirements. Bring your car to GCD for all of your Audi steering and suspension needs. Here at German Car Depot we use all original equipment, parts such as struts and shocks that are designed and manufactured to the car manufacturer's exacting specifications. The use of aftermarket struts or shocks may seriously affect the way your car responds to braking input, road conditions and your steering. The cost savings on a cheap brand is quickly wasted in gas mileage, premature tire wear and suspension issues.